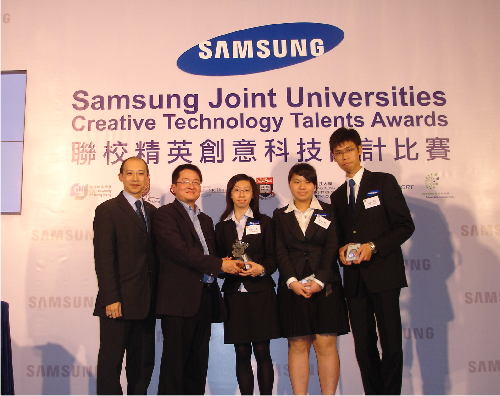 Two teams of EEE students won two Excellence Awards in the 2008 Samsung Joint Universities Creative Technology Talents Awards. The final was held in the Hong Kong Cyberport on 16 February 2009. Twelve teams shortlisted from the first round of 56 teams presented and demonstrated their innovative ideas to the judging panels. One team called “Elite Innovators” comprised four Information Engineering Year 2 students: Cheng Ka Chung, Cheng Ho Yin, Wong Wing Kit and Ho Chun Yin won an Excellence Award with their prototype using an old refrigerator as an organic food incubator. Another team called “Green Revolution” comprised of students from Electrical Engineering and Medical Engineering: Kelvin Ma (EE-1), Chan Yee Wah (MedE-1) and Chan Pui Wai (MedE-1) won another Excellence Award with their project of perfume printer. “We are very surprised that our team can win the Excellence Award as all members in our team are just year 1 students.” said Kelvin Ma (EE-1) the leader of the Green Revolution team. “We are very happy that we can learn a lot of practical knowledge through this competition. We would like to thank for the supports from our Department, especially the assistance and advices from Mr. C.L. Chan and Dr. Wilton Fok.” said Cheng Ka Chung (InfoE-2) the leader of the Elite Innovator team. Dr. Wilton Fok (from the second left), Chan Yee Wah (MedE-1) and Chan Pui Wai (MedE-1) and Ma Tsun Ting (EE-1) received the trophy from Mr. Joseph Wan, the Director of the Samsung IT Biz Team (the first left). From left: Dr. Wilton Fok, Mr. C.L. Chan, Cheng Ka Chung, Wong Wing Kit, Cheng Ho Yin, Ho Chun Yin, and Prof. Y.S. Hung cheered for the award together. The team “Green Revolution”: Chan Yee Wah (MedE-1) , Chan Pui Wai (MedE-1), Ma Tsun Ting (EE-1) and their project advisor Dr. Wilton Fok. The project was perfume printer. The team “Elite Innovators” Cheng Ka Chung, Cheng Ho Yin, Wong Wing Kit and Ho Chun Yin with their product turned from an old refrigerator into an organic food incubator. Cheng Ka Chung, Cheng Ho Yin, Wong Wing Kit and Ho Chun Yin presented their idea to the judging panel. Another team called “New Idea” comprised of Mou Wai Ki (EE2), Chan Kaai Hei (EE2), Tong Lok Ki (EE2) and Chiu Tak Shing (EE2) presented and demonstrated their prototype of “Octopus” trolley to the judging panel.